Located in Andrianou str., one of the most popular streets in Monastiraki area, Kotili café – restaurant, offers its clients a special dining experience. Just a few minutes away from “Monastiraki” and “Akropolis” metro stations, this unique and beautiful café restaurant will grand you moments of serenity in its beautiful coutyard, where you can enjoy your meal, coffee or drink. The chef’s suggestions such as: Feta Kotyli, Tenderloin Kotyli, the Fisherman's Platter and the variety of the appetizers are really delecious! You will be impressed by the wide variety of the salted preserves, the fresh salads, the handmade sweets with the Banofi as a star. 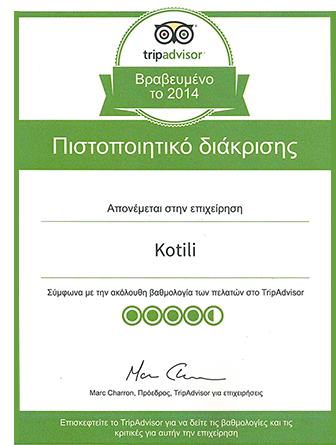 The name of the restaurant Kotili is directly connected with Ancient Greece. It was kind of measure and a type of glass. Kotili was also used during religious ceremonies as a sacrificial vessel used by the priest for libations of wine . The friendly and quick service of the restaurant will amaze you! Soon Kotili will be your hot-spot! Have a good time! Visit Kotili café restaurant and you’ll have a special dining experience!